If you’re one of the 84% of people worldwide who claim they “couldn’t go a day” without a mobile phone in hand, you are clearly not alone! We’ve never been more passionate users of mobile devices than we are right now. At my company, Artez Interactive, we clearly can see the rising importance of smartphones and tablets by looking at the traffic to fundraising and donation pages on our North American platform. Of the millions of unique visitors to our system every month, over 15% are visiting on mobile devices. As we increasingly adopt mobile devices in our professional and personal lives, we are also turning to mobile technology to help us support charitable causes. We wanted to know more about the impact of mobile devices on peer-to-peer, or “crowd-sourced,” fundraising campaigns. When individuals are motivated to ask their friends and social networks to donate to a cause, are those supporters using smartphones and tablets to help them fundraise? Similarly, are donors in peer-driven events giving through mobile-web enabled devices? We examined the fundraising success of 83,566 participants in a variety of peer-to-peer fundraising campaigns to help answer that question for our Mobile Matters Whitepaper. Some of the individuals in this study were participating in traditional run, walk, or cycle-a-thon events. Others were encouraged to host a party for a cause or raise pledges toward the completion of a challenging activity. All participants were asked to sign up on a charitable organization’s website and collect donations on a personal fundraising page towards their fundraising goal. Event website: Participants on laptops and computers had the option to log into the campaign’s website to send solicitation emails, post on social media sites, upload photos and personal messages, and track donations through an online fundraising console. Mobile website: Participants on mobile devices automatically experienced a mobileversion of the campaign website, allowing them to log into the site and raise money through a mobile-optimized version of the fundraising console. Mobile app: Participants with an Android or iOS device could download the event’s free mobile application (“app”) from Google Play or the iTunes store. The app allowed participants to log into a version of the campaign’s fundraising console, access their device’s contact list for email, post to social sites, and upload photos taken from their smartphones. Given these options, we discovered that 23% of all participants chose to log into the mobile web site, download and log into the mobile app, or use both mobile options. 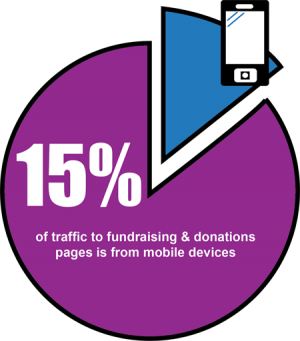 (The highest percentage of “mobile fundraisers” we saw in any individual campaign was 37%.) That means that overall, almost one in four registrants used mobile tools to fundraise for their cause. In each campaign we examined, mobile fundraisers raised more money than those who used the web only. Participants who chose to use one mobile tool (mobile web or mobile app) raised 2.2 times more money than non-mobile participants. Individuals who used both mobile web and a mobile app were even more successful, raising 2.95 times more than non-mobile participants. These “heaviest mobile users” represented some of the most successful fundraisers in each campaign. Do mobile fundraisers simply have wealthier friends? No! Mobile fundraisers raised more individual pledges from friends and family than non-mobile fundraisers. The online-only group of participants averaged 5.1 individual donations. When participants used one mobile tool, either web or app, they earned an average 8.4 individual donations. 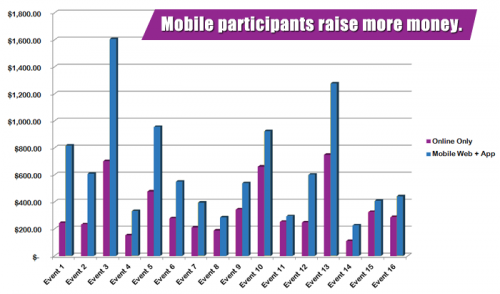 Participants who used both mobile web and mobile apps earned even more, on average 11.4 individual donations. Why are mobile fundraisers more successful at raising money? It’s possible that mobile tools themselves help participants raise more money, encouraging them to check their messages and fundraising totals on-the-go, or make more individual requests for donations. It’s also possible that a campaign’s most engaged, most enthusiastic, and best performing fundraisers are also big fans of smartphones and tablets. Most event fundraising professionals are well aware of the “80/20 Rule” proposing that, in general, 80% of donations will be generated by 20% of the most active participants. Either scenario suggests it’s important for fundraising campaigns to provide mobile technology options for participants. Participant success is only one piece of the mobile picture. Many people think of “mobile donations” as meaning gifts by text-to-donate (SMS). However, with the shift toward mobile web and responsive design, it’s now easier for donors on smartphones and tablets to give by credit card or PayPal directly through a charity’s mobile-optimized donation form. With mobile traffic to charity and nonprofit pages hovering at 15%, we wondered about the donors in these peer-driven campaigns. 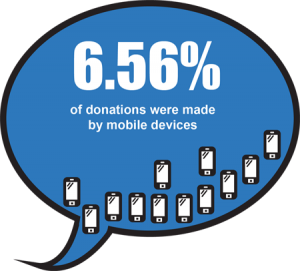 Are donors giving on mobile devices? 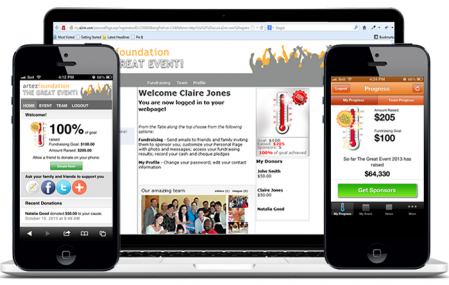 What’s driving the rapid rise of mobile web donations? The fact that almost 50% of Americans now own smartphones is just the beginning of the explanation. We also know that the majority of tweets are read on a mobile device and that users of mobile Facebook are twice as active on Facebook as those on computers. When event participants share fundraising page links on social sites, it’s more likely than ever before that their potential sponsors may view that post or tweet through a mobile device. Our Fundraising with Facebook Whitepaper review of 645,000 individual donations in peer-driven events found that over 15% of those pledges were directly referred from Facebook. Email is another platform driving donors to pledge by mobile web. Adobe’s 2013 Digital Publishing Report noted that 79% of smartphone owners use their device for reading email. In fact, that’s a higher percentage than those who use it for making phone calls! We know that donors are motivated to give after reading personal emails from a friend or family member. When fundraising participants send emails to friends asking for donations, there’s a good chance their requests could be read on a smartphone or tablet. It’s refreshing that the conversation about mobile technology in the non-profit sector has evolved beyond text-to-donate to include mobile design and apps as other important elements of an integrated fundraising campaign. Have these insights piqued your curiosity? Claire Kerr has worked for non-profit organizations in the economic development, education, and health and research sectors. As Director of Digital Philanthropy at Artez Interactive, Claire works with charities as they fundraise through web, social, and mobile channels. Follow her on Twitter at @snotforprofit. This article originally appeared on the NTEN blog.